There’s good reason why Guide Michelin-rated restaurants across the world choose to serve Aceituno Premium Extra Virgin Oil – this high-quality oil is worthy of selective palates. Fresh, fruity and with notes of mint, green almonds, artichoke and fennel, our extra virgin oil strikes a perfect balance in intensity between spicy and bitter. Aceituno Premium Extra Virgin Oil is produced from olives that grow at 1300 meters above sea level in the Spanish mountain range Sierra Sur de Jaén. The olives are harvested early in the season, when the oil content is still low and the fruits are green and chock full of chlorphyll and polyphenols, which give the oil its unique, intense colour. The olives are then cold pressed within hours of harvest to preserve the freshness. Our Aceituno Premium Extra Virgin Oil has been awarded for its high content of Vitamin E, polyphenols and monounsaturated fats, which may help reduce inflammation and lower the risk of heart disease. The oil is best served cold, for example as a base in salad dressing, sprinkled on top of fish or as a dip for warm bread. 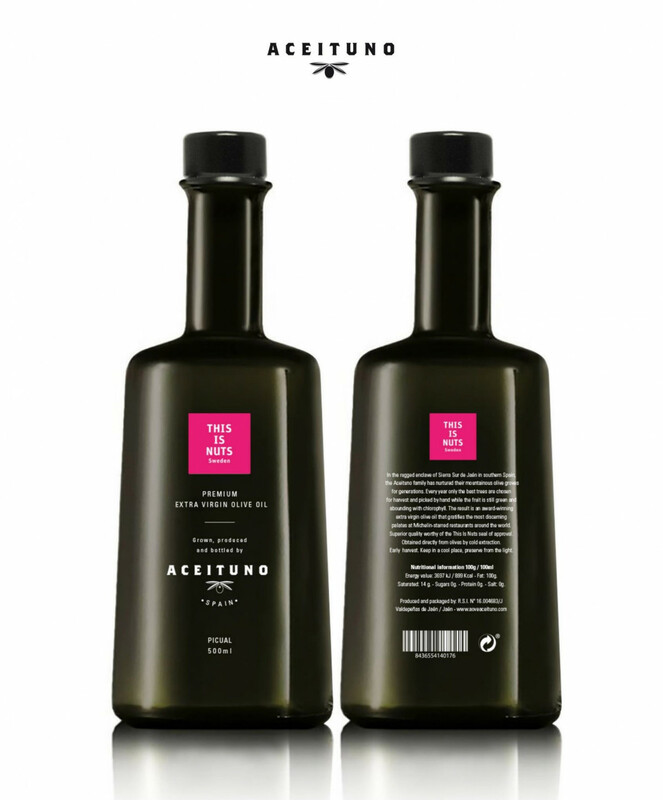 In the summer of 2018, the outstanding quality of the Aceituno extra virgin olive oil came to the attention of This Is Nuts Sweden and marked the beginning of a fruitful partnership. A company known for dry-roasting its nuts with a unique technique originating in the ancient Middle East, This Is Nuts Sweden is now committed to bringing the fruity, fresh flavour of Aceituno to a limited number of venues worldwide. We think of it as a perfect culinary marriage of the most exquisite olive oil and the most delectable nuts. . I do best in cool temperatures and when I’m not exposed to direct sunlight.